Time Dependent Dieletric Breakdown - mb-techs Webseite! * Various SMU models available, see specs. The test system UX20 has been developed for lifetime studies on oxyde structures of integrated circuits. Each DUT (device under test) will be stressed individually by an voltage ramp consisting of up to 500 voltage-time points. Continuous current measurements allow a precise monitoring of the DUTs to be stressed. For this system a multiplexer is not necessary. 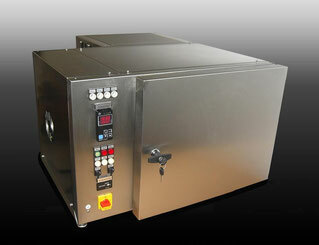 The system consists of an oven with a built-in load electronic and four customer specific DUT-boards. This compact design doesn't require any additional wiring. Per oven eight different voltage ramps can be executed. All DUT's have their own ammeter, so that no interruptions by switching the channels and no mutual interference of DUTs may occur. All functions of the system will be controlled by the interactive software mb-Tester. Besides the basefunctions for creating setups and execute experiments the software has additional features such as: analysis of the measurement data, customized export data interface, a built-in scripting language for the adjustment of experiment flow, monitoring and status functions. As failure criteria a maximum or minimum current value, or a current surge can be defined. Before the stress ramp is started, leakage current and capacity can be measured optionally. The stress ramp can be defined of up to 500 voltage - time values. The built-in monitor function allows the additional periodical measurement at a different monitoring voltage. Defective DUTs will be automatically turned off by the system. Optional: measurements on wafer level, degradation investigations of diodes, MOS- and bipolar transistors, BTS- and NBTI-measurements , combination with SMUs from mb-technologies.